As research students begin to scope their dissertation projects, they often ask about the availability of company data for a specific market (country). Two basic questions are how many companies are covered by a database, and how much historical data is available. 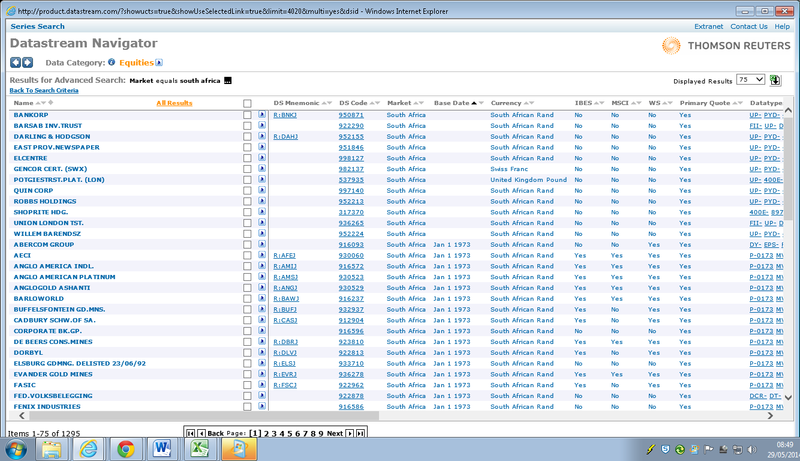 This post will take South Africa and Datastream as a concrete example, but it can be adapted to other databases. A total of 1295 is a reasonable number of companies, and the results show that data is available from January 1 1973. 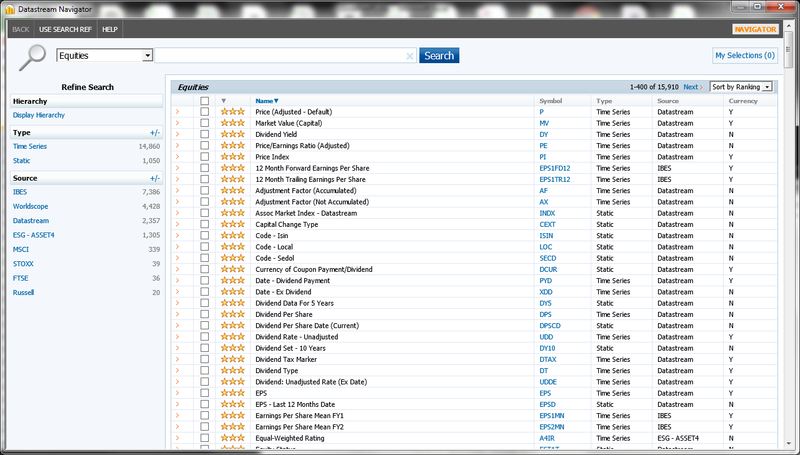 This list can be downloaded for further analysis using the Excel icon at the top right. One of the columns in the Datastream Navigator output, WS, indicates whether the company is in Worldscope, and therefore whether company accounts information is available. The Datastream Base Date (BDATE) variable gives the first date for which price data is available for a company (equity series). There is a Worldscope variable WC11516, Date added to product, but when a company is added this can include historical accounts data. For example, the company AECI (dscode 930060) has a value for WC11516 of 19920609 indicating it was added to Worldscope in June 1992. However a time series request for net sales (WC01001) shows that data is available at least from 1980. Creating a Datastream list and then doing a few test requests is the quickest way to check the availability of specific data items. 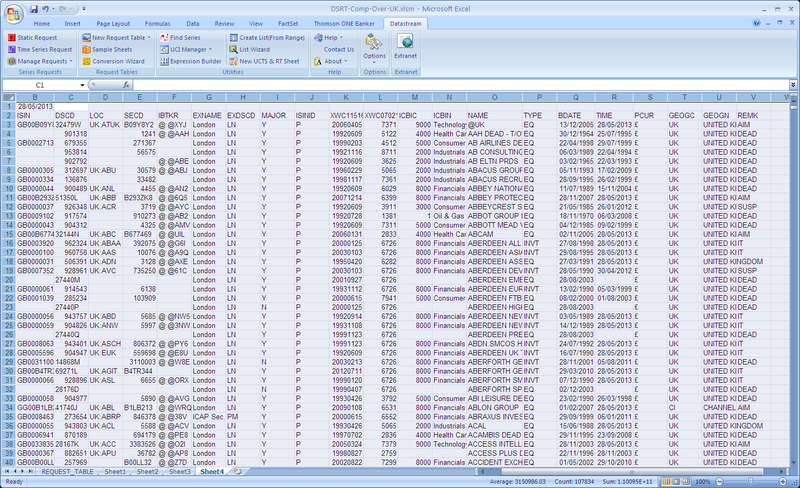 See our guide Datastream Part 2 (List Creation) for more details. Datastream covers approximately 1300 South African companies, about 400 of which are active (on May 28 2014), and price data goes back to 1973. Company accounts data is available for approx 850 of these 1300 companies, and data pre-1990 looks limited. Thomson Reuters Datastream now has a updated version of Datastream Navigator (version 4.5). The most obvious difference is that the “datatype search” screen has been redesigned – see screenshot below. The results are displayed using “Sort by Ranking” as default. For equities and equity indices the datatype RI (total return index) is a little way down. (I guess it is not as popular with commercial Datastream users as academic ones.) If you want “key datatypes” then use the “Display Hierarchy” link on the left-hand side. Selecting a row will give the definition in a pop-up window – clicking the symbol link selects the datatype. Use the check-boxes at the left if you want to select multiple datatypes. There is further information available on the “Help” tab, including a Thomson Reuters training video What’s new in Datastream Navigator 4.4 (Thomson Reuters Datastream customers only). Finally, you may wish to use our three Datastream getting started guides, updated to reflect the changes above. Thomson Reuters Datastream has worldwide coverage and includes a number of pre-defined constituent lists that can be used as a starting point. WSCOPEUK is a list of UK companies that are also covered by the Worldscope company accounts database. On 28 May 2013 WSCOPEUK contains 5015 securities (a few companies issue multiple securities). However, as with the list of current UK companies from the London Stock Exchange (LSE), there are a number of filters that we might want to apply. 205 securities are not listed on the LSE – most of these are on ICAP Sec & Der.E (formerly UK Plus) exchange, some have no value for EXNAME. 169 securities are not the major security of the company. 86 securities are not the primary listing of the security. One potential limitation of WSCOPEUK is that it only includes companies that delisted/died in 1985 or later. Indeed the data for early years looks sparse – it has 7 companies that died in 1985 and 11 companies that died in 1986. Of these 5082 securities/companies, 4872 died after 31 Dec 1984, 678 died in 1985 and 150 died in 1986. As in part 1 the number of companies depends on how you choose to define “UK listed companies” and the time period that you are considering. One major advantage of using Thomson Reuters Datastream in this investigation is that the companies can be identified using codes (in this case the Datastream dscode) rather than names so getting further data is easier. Looking at the Datastream Navigator summary data for WSCOPEUK it is clear that this constituent list includes unquoted companies for which there is no share price data, and there are many UK listed companies where Datastream has share price data but no accounting data in Worldscope. Having discovered while writing this post that there are more issues here than expected further analysis is postponed to part3. The analysis of Datastream’s coverage of UK companies was done using the Datastream Navigator advanced search, and a DS request table to get static data about all members of constituent lists WSCOPEUK, FBRIT and DEADUK – see screenshot for example results. Worldscope is the global company accounts “database” from Thomson Reuters and thus a key research resource for company information. It is accessed using either Datastream (active and inactive companies) or Thomson One Banker (active companies only). Worldscope is designed to allow comparison of companies that report under different accounting rules worldwide. In addition, it records company information using four templates: banks, industrial companies, insurance companies and other financial companies. This means that many of Worldscope’s datatypes only have values for a subset of the companies covered (e.g. US companies). For full details of the Worldscope methodology and the definitions of the datatypes you can consult the Worldscope Data Definitions Guide (Issue 14) available from the Datastream Extranet. 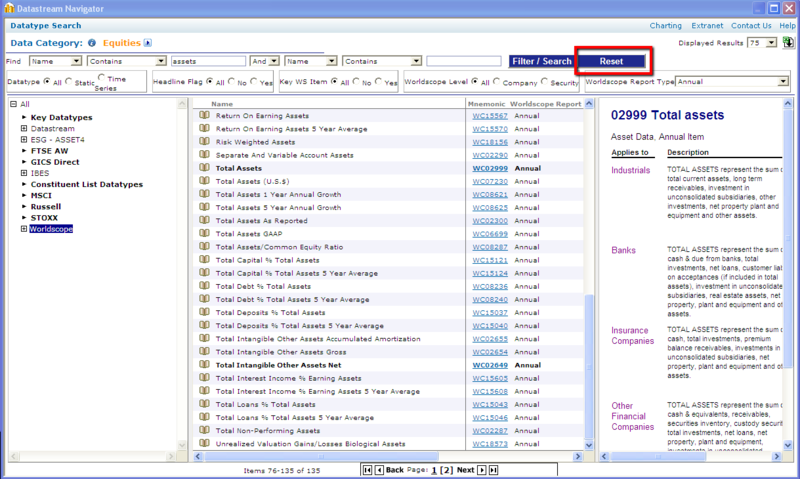 Worldscope is not the only database for company accounts (financials) – for example Compustat, available through WRDS, is very popular with researchers studying US companies and Bloomberg’s Financial Analysis (FA) function gives company account information. The term “company financials” is often used rather than “company accounts”. The library has a number of useful resources for the financial analysis of public companies (companies quoted on a stock exchange). Thomson Reuters’ Worldscope database provides historical accounting data – balance sheet, income statement and cash flow statement. It is available through Thomson One Banker and Datastream. Bloomberg also has accounting data – command FA (Financial Analysis). 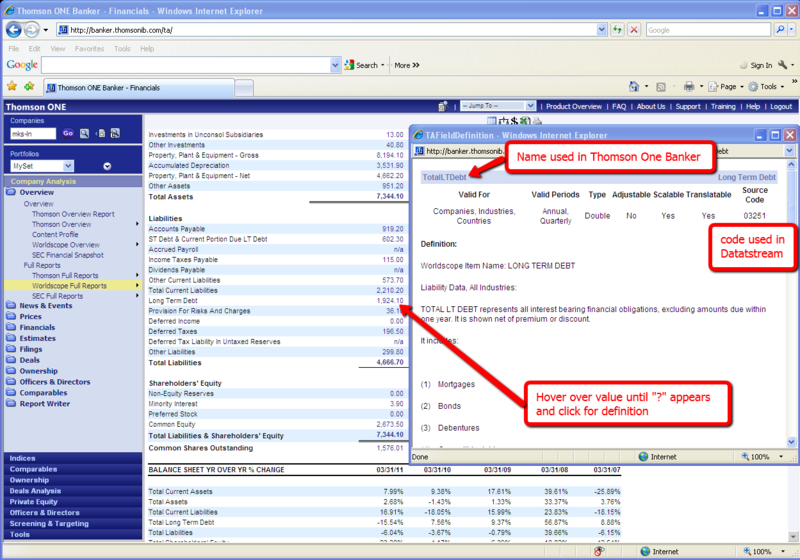 Thomson One Banker, Datastream and Bloomberg can also provide data on a company’s financial market performance – e.g. historical shares prices and returns, and corresponding data for market indices. Analyst/Broker reports are available from Thomson Research and Bloomberg (command BRC). Factiva from Dow Jones is a extensive online news database covering a wide range of sources. (See How Business News can enhance you research for more details.) Bloomberg also provides a wide range of company, financial market and economic news. What are the units in Datastream for the accounting variables, e.g. total assets, net debt, EBITDA? 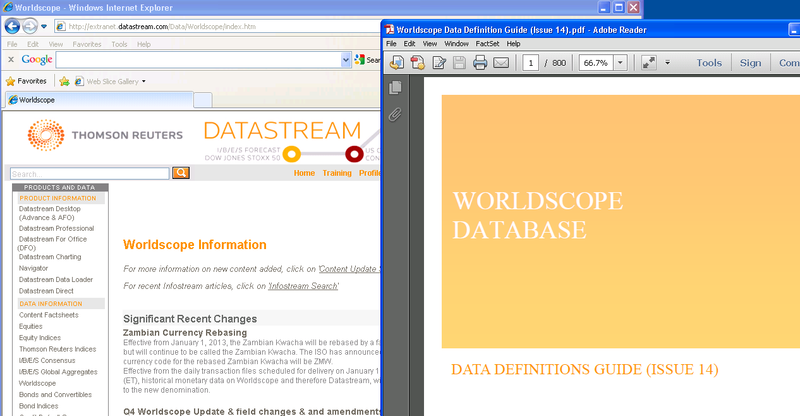 Most of the accounting data from Worldscope to Datastream is in thousands. Per share data & number of employees are available in actual. The variable/datatype Market Value (MV) is in millions, while the similar Worldscope variable Market Capitalization (WC08001) is in thousands (and an annual rather than a daily figure). Using Thomson One Banker to get Worldscope data the default unit (scaling factor) is millions, though this can be changed or you can explicitly request the details by asking for WS.TotalAssets.ScalingFactor or WS.TotalAssets.ScalingFactorText (see Excel examples below). The large number of data items (datatypes) available in Worldscope can make it difficult to find the ones that you want. The following tips might help. Access pre-defined Worldscope report in the TOB Excel add-in – select a value and the TOB worldscope name will appear in the description of the cell contents e.g. Worldscope meets Compustat: A Comparison of Financial Databases by Niels Ulbricht and Christian Weiner may be useful if you are looking to find comparable Worldscope and Compustat data items.